There is nothing that brings history alive as much as events that overwhelm the senses and immerse an individual in an environment completely foreign to the modern world. The aroma of smoked, brain-tanned buckskins and pungent beaver castor, mixed with the scent of pine or sage and a whiff of wood-smoke. Or, the sound of creaking saddle leather, whinnying horses or braying mules as audible backdrops to distant snow-capped peaks dotting the horizon and looming over plains and valleys of sagebrush and tree-lined streams. Those are the kind of events that are the hallmark of The American Mountain Men (AMM). The specific and primary purpose for which this association is formed is to establish and maintain a permanent association for research into and the study of the history, traditions, tools, mode of living, etc., of the trappers, explorers and traders known as the Mountain Men. Further purposes are to establish and maintain a permanent museum and research center to house and make available books, artifacts, films, speakers, etc. ; to provide a means for the dissemination of information related to our purposes and objectives; to provide a continuous program of living history; to teach the skills and help develop the abilities which were actually needed and used by the original Mountain Men; to help preserve the right of all free men to keep and bear arms; to help preserve our native wilderness and wildlife by teaching and practicing realistic conservation; to help establish brotherhood and trust between our members and to help our members find the deep affinity with nature that is a basic and necessary trait of all true Mountain Men. Those objectives are routinely addressed by the AMM as an organization, and by individual members, from the public educational aspects in general, and the historical and academic activities related to the period, to the ever-present outdoor skills aspect which all members are expected to develop and hone over time. On an educational level, it would be difficult for such a small organization to build and maintain a facility of its own to house a museum and research facility. Nevertheless, the established relationship with the world class Museum of the Mountain Man, in Pinedale, Wyoming, provides one of the many platforms for the AMM to satisfy the objective of teaching the skills and history of the mountain men. At the same time the relationship provides ongoing displays, interpreters and living history participants for numerous events at the museum. On an historical, academic level, various members of the AMM have published a variety of well-researched articles and books on topics directly related to the mountain men and the Rocky Mountain fur trade. It is not unusual to find a member dressed in buckskins in the wilderness one week, only to find that same individual dressed in modern attire and presenting at an academic conference the following week. Such activity is crucial to the AMM’s mission to perform the “research into and the study of the history, traditions, tools, mode of living, etc., of the trappers, explorers and traders known as the Mountain Men.” By doing so, members help to position the AMM as a serious participant in the academic research and study of the time period. Finally, on the outdoor skills level, there are those in the AMM that have honed their skills over decades of hands-on experience in the back-country wilderness. The confidence to be able to plan, organize and execute a pack trip into the wilderness without guides and modern ‘conveniences,’ is not something that most individuals in today’s society would necessarily possess. However, that confidence is now honed from experience in many members – experience using pre-1840 equipment and skills. Quite literally – living history! 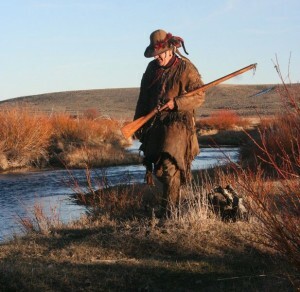 The blend of the educational, academic and practical outdoor skills and the ability of its members to survive alone under primitive conditions using the clothing equipment and skills of the original mountain men helps make the AMM unique. In addition, by default, that blend of traits also helps to make it one of the best historical, living-history organizations portraying the mountain men and the early West. For more information on the AMM, Click here to view the American Mountain Men’s website!